Internet Tracks Washer from softcows is our #1 ranked online privacy protection software. Internet Tracks Washer has a nice user interface and is very easy to use. 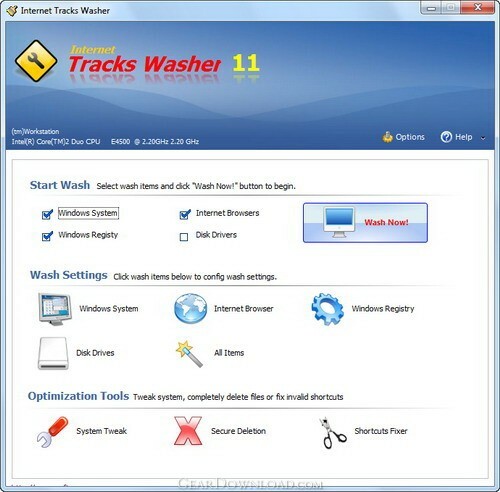 Internet Tracks Washer's main job is cleaning tracks from Windows system, internet browsers and third-party applications; cleaning invalid entries or sections in Windows Registry; searching and cleaning junk files in disk drives. Besides it's main job, Internet Tracks Washer also provide other useful functions such as "Secure Deletion" will completely overwrite files with random characters several times to make them unrecoverable by file recovery utilities. Overall, Internet Tracks Washer is an excellent choice for the experienced users and novice users. With its versatile features and its privacy effectiveness, it is the best value for your money. This download (wtwasher.exe) was tested thoroughly and was found 100% clean. Click "Report Spyware" link on the top if you found this software contains any form of malware, including but not limited to: spyware, viruses, trojans and backdoors. Ardamax Keylogger 4.0.4 - Captures ALL keystrokes into a log file. ABF Password Recovery 1.74 - ABF Password Recovery is a program to retrieve lost or forgotten passwords. Simply Accounting Password Recovery 1.0d - Recovers lost or forgotten passwords for Simply Accounting company files. R-Firewall 1.0 - R-Firewall is free and effective solution to secure your on-line activity. R-Wipe & Clean 9.9 - A complete solution to clean private records and free up disk space. ACT Password Recovery 1.0c - Recovers lost or forgotten passwords for ACT! contact management files. WinShredder: Securely shred your files and folders 1.0 - NEW! Permanently erase your sensitive computer files using secure shredding.